Jeff is undoubtedly one of the most accomplished football coaches in Arizona at both the high school and junior college levels. He coached Sabino High School to three state championships (1990, 1992, 1998), two runners-up and reached the playoffs 10 times. He earned Arizona Coach of the Year honors in 1990, 1998 and 1999. In addition, he was honored by the National Football League as High School Coach of the Week on Nov. 7, 1997. His high school teams three times were ranked among the top 25 teams in the nation by USA Today. As a high school coach in Arizona, Jeff’s overall record was 173-55-1 through 1999. 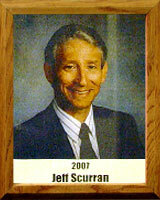 Scurran started a new football program at Pima College in 2001 and immediately built the program into a winner. The Storm, as the program was called then, won its inaugural game by defeating defending national JC champion Glendale College 28-20. By 2004, the Storm was among the top junior college programs in the country. Pima earned a trip to the 2004 Pilgrim’s Pride Bowl Classic and defeated No. 2-ranked Kilgore (Texas) College, 10-7, in a game at Mount Pleasant, Tex. Pima finished the season with a 9-3 record and was ranked 13th in the country. Scurran finished his Pima career in 2004 with a record of 26-17.